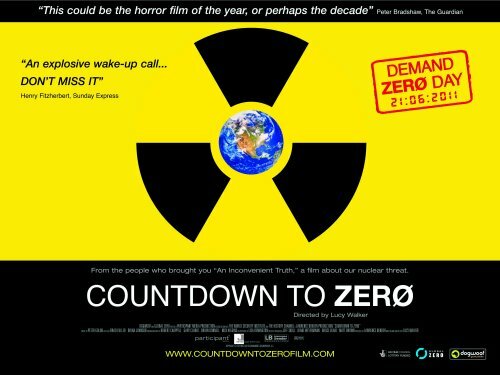 COUNTDOWN TO ZERO is a compelling documentary by renowned British filmmaker and Academy Award® nominee Lucy Walker (Waste Land, Blindsight), which offers a passionate and riveting look at the history of the atomic bomb and the chilling threat posed by nuclear arms stockpiles today. COUNTDOWN TO ZERO is the first documentary since An Inconvenient Truth to be invited to screen in Official Selection at both Sundance and Cannes Film Festivals. COUNTDOWN TO ZERO traces the history of the atomic bomb from its origins to the present state of global affairs: nine nations possessing nuclear weapons capabilities with others racing to join them, with the world held in a delicate balance that could be shattered by an act of terrorism, failed diplomacy, or a simple accident. Written and directed by acclaimed documentarian Lucy Walker, the film features an array of important international statesmen, including former world leaders Jimmy Carter, Mikhail Gorbachev, Pervez Musharraf and Tony Blair. It makes a compelling case for worldwide nuclear disarmament, an issue more topical than ever with the Obama administration working to revive this goal today. COUNTDOWN TO ZERO will be released nationwide on June 24, 2011.